Coming very soon to a PUMA store (and online) near you - this dynamic wedge boots from the footwear company known for their amazing sneakers. Join me in welcoming the PUMA by Hussein Chalayan Hakkoda Zip Wedge Boots, a wedge boot created by British/Turkish Cypriot fashion designer, Hussein Chalayan for PUMA. The Hakkoda Zip is part of a collection inspired by urban exploration. 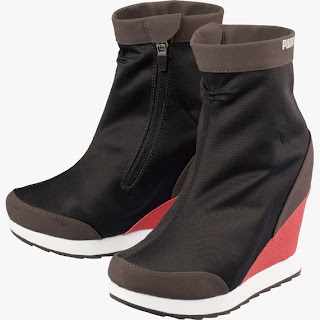 Featuring neoprene and leather, with suede panels on the heel cup, toe cap, and around the ankle, as well as slight shirring on the shaft, this contemporary wedge boot is perfect for the city explorer aka we edgy NYC Ladies. A pop of color on the 3 1/2" wedge heel stands out against the solid body. Along with the above Phantom Black, the Hakkoda Zip also comes in Dove (light grey) and Steel Grey. I'm super excited for these as they are one of my favorite PUMA styles for Fall 2013. I love the black because it'll go with just bout everything but I am completely enamored with the Dove, something about that stunning turquoise on the heel against that light grey is stunning.